2. What goes into making a map? Knowing where we are means that we have to use some system which allows us to specify with numbers where we are located. The system that we use is geographic coordinate system, and with it we can use two numbers, longitude and latitude, to describe the position on the Earth of any object (or city, airport, house, or even a person waiting at a crosswalk at an intersection). Learn more about latitude and longitude going to our Map Navigation Science Factoid. Because the earth is round, and our maps are flat pieces of paper, we must project the features we observed onto the map surface. There are many different mathematical methods which also us to represent a three-dimensional object on a flat surface. 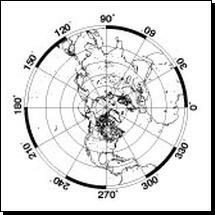 Some common map projections are Mercator projections, in which the spherical surface of the earth is projected onto a cylinder and then the paper unrolled, conic projections in which a cone-shaped piece of paper encloses a hemisphere, and planar or azimuthal projections such as orthographic, stereographic, or gnomonic maps which are projected as planes through the Earth. Maps of the Earth displayed using a Mercator projection and stereographic projection. When we navigate in the ocean in equatorial regions, ship captains often use Mercator projection maps to determine the bearing at which to steer the ship because directions remain true along any path between any two points on this type of map. In the polar regions, a good map to use would be a gnomonic map, because any straight line between two points on this map corresponds to a great circle, and the shortest distance between two points on a globe. Now read more about Navigation by going to the USGS Learning Web. As an activity at the end of this module, well create a Mercator projection map and then plot ship tracks on it. In making maps, we consider not only what type of projection we want to use, but also, what scale best shows the data we want to map, and what symbols we want to use to convey the information. All this information becomes part of the legend on the which tells the reader how to accurately interpret what the map means. For a nice overview on mapmaking, read the lesson on Map Information on the USGS Learning Web. At the end of this module, well create a thematic map which shows the distribution and depth of earthquakes that occur on the Big Island of Hawaii. To represent the surface of the seafloor, which is three-dimensional in character, on a piece of paper that is two-dimensional, we make contour maps. Each contour line on a contour map shows the location of elevations, or water depths, that are the same height. To represent a hill on a contour map, we would draw concentric circles, with each circle representing a different elevation. If the hill were a ridge, then the shape of the closed contour line would be elongated or long and narrow.